Who really burned the mosque? 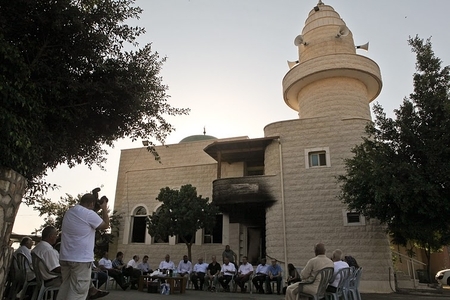 Delegation of left-wing Israelis visits damaged Tuba Zangaria mosque to 'make amends'. But what if it was torched by Arabs? I have written about how the so-called ‘price tag’ actions have been a goldmine for anti-Israel propaganda. Although there seem to have been a few cases where vandals were actually caught, in others it seems as though the police have simply “rounded up the usual [right-wing activist] suspects.” After a burst of publicity about how they are doing their job, they are forced to release them for lack of actual evidence. We know that the manufacturing of Israeli ‘crimes’ is a cottage industry for Palestinians. There was the notorious case of Mohammed Dura, the ‘Jenin massacre‘ in which nobody was massacred, the Gaza Beach incident (where navy ships allegedly fired on Palestinian picnickers), and countless incidents alleged to have occurred during Operation Cast Lead which found their way into the Goldstone Report. Hizballah also faked numerous ‘war crimes’, such as the rocketing of a Red Cross ambulance, etc. In addition to the fact that the act was morally wrong, it was unbelievably stupid. There is still a gag order on details of the case, but I’m sure that when we find them out, we will see that the perpetrator is not the brightest bulb in the chandelier. The “price tag” attacks are supposed to deter Arabs from vandalism, terrorism and even murder by making them pay a ‘price’. This can’t possibly work, since it simply motivates the Arabs to respond in kind, something they are overjoyed to have an excuse to do. So the strategy is both wrong and ineffective. But there’s more: it’s a huge gift to our enemies in the information war. It provides the grain of truth needed to validate the exaggerations and outright lies that will be told in order to establish that ‘both sides’ are at fault, even that ‘both sides engage in terrorism’. Since then, several Jewish suspects were arrested and then released for lack of evidence. Now an independent investigation has raised very serious doubts about the likelihood that ‘settlers’ were responsible for this attack. Many [Israelis] have internalized the propaganda of Israel’s enemies. They are prepared to believe that IDF soldiers would continue to fire on a target like al-Dura and his father, who are obviously not firing back and not even armed, for 40 minutes. This is not the same as saying that ‘accidents happen’, it is agreeing that the IDF is either criminally negligent or deliberately murderous, which is what the Arab and European press constantly say. It seems to me that some Israelis and Jews have a moral inferiority complex. Even though they would not admit this, deep down they are not sure that Israel has a right to exist. Although they understand intellectually that Israel is in a life and death struggle with the Arab world and Iran, emotionally there is a feeling that they are in the wrong. The ‘Price Tag’ actions do not benefit the ‘settlers’ in any way and they do not help the state. They are, in a sense, ‘too good to be true’ for Israel’s enemies. It is of utmost importance that the perpetrators be caught and exposed, and given the precedent for Arab manipulation of the media, the possibility that Arabs are responsible for many of them must be taken seriously by the police and Shabak. Update [16 Mar 2012 0826 PDT]: Apparently, some Arab youth are not averse to including “death to Arabs” in Hebrew in their graffiti. Now why would they do that? [Hamas leader Khalid Mashaal and the PLO’s Mahmoud Abbas] held a November 24 summit meeting in Cairo where they reportedly agreed on main three points: a Palestinian state will be established in the West Bank and Gaza Strip; non-violent resistance will be the tool for achieving this goal; and legislative and presidential elections will take place on May 4, 2012. The first point tacitly acknowledges Israel’s right to exist and the second would align Hamas’ strategy with that of Abbas, who is committed to seeking a negotiated peace with Israel. Jane’s Defence & Security Intelligence & Analysis was the first to report Hamas’ acceptance to give up armed resistance. The Movement stressed the need to continue what has been the achievements on the road to achieving national reconciliation and to end the division and the consolidation of the national front of all forces and factions within the strategy of struggle unified, re-activation of the Palestine Liberation Organization on the basis of protecting the constants and the rights and sanctities, and achieve the aspirations of the Palestinian people for liberation and return. The translation is slightly rough, but the meaning is clear. Hamas is prepared to join together with the PLO, but only to continue its jihad against the Jewish state. Indeed the idea is to get the PLO back on the jihad bus itself. Hamas moderating? Nope. As always, reports of Hamas moderation have been greatly exaggerated. I’ve written numerous articles over the past few years about Jews, Israel and the Armenian Genocide. The subject is current yet again, as the Knesset is discussing whether or not Israel should officially recognize it. My position has always been that the Genocide is a historical fact and should be recognized as such. The US has never done so — during the cold war, Turkey was considered an integral part of the anti-Soviet alliance, and it is still considered by the Obama Administration too important an ally to irritate unnecessarily, despite agitation by Armenians in the US (and to no small extent in Fresno, which is one of the centers of Armenian population in the US). The US State Department has been happy to suggest that the failure to pass bills calling for recognition has been the fault of the “Israel Lobby.” Last year a local Armenian activist published an op-ed in the Fresno Bee pushing this theory. The article went so far as to say that “the Jewish lobby was complicit” in genocide denial, and since “denial is the last stage of genocide,” in genocide itself. The Middle East is a complicated place, and there are not just two sides. Iran, Turkey and Egypt all see themselves as replacing the US as the major power in the region. Turkey has aspirations to expand its influence as a Sunni Islamist power, which have put it in conflict with Iran, Hizballah and the Assad regime in Syria. The US may be fooling itself in thinking that Turkey is an ally in this respect. Insofar as it is acting in concert with the US, it is doing so for its own motives. Although Turkey would try to punish the US in some fashion, I doubt there would be any major change in policy if Congress finally passed a bill recognizing the Genocide. In Israel there are still those who think that the relationship with Turkey can be repaired, although it seems evident that AKP Islamist ideology is moving in the opposite direction. One real concern is for the small Jewish community in Turkey. At the time of one of the previous debates in the US, the Turkish Ambassador suggested that antisemitism in Turkey might get out of control if Israel did not prevent Congress from passing the bill! In addition to the repulsiveness of holding this small mostly elderly community hostage, this plays into the stupid and offensive notion that the “Jewish lobby” has the power to control the US Congress — something that my Armenian activist friend apparently agrees with. Interestingly, it’s mostly been the Left in both the US and Israel that has called for recognition. Perhaps I’m cynical, but this may change now that Turkey has moved farther on the road to Islamism and hostility to Israel and the US. Those that take every opportunity to attack Israel find this issue congenial. If Israel does not recognize the Genocide, it’s because of ugly political expediency. If it does, then it’s only to punish the Turks for exposing Israel’s ‘mistreatment’ of the saintly Palestinian Arabs. 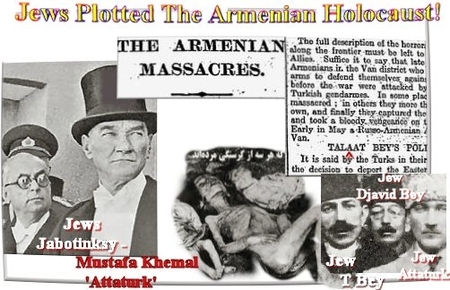 A particularly offensive position commonly attributed to Jews is that recognition of the Armenian Genocide would diminish the importance of the Jewish Holocaust. Kenneth Segal, a former rabbi of the local Reform Temple in Fresno once made an effort at rapprochement with the Armenian community and even got a resolution passed at the Reform movement’s biennial convention in 1989. Segal was unsparing in criticizing the state of Israel, as was the Armenian pastor he invited to speak at his temple. Apparently it was not considered possible to recognize that a crime was committed by Turks in 1915 without bashing Israel. I think that its time for both Israel and the US to put the issue to rest and admit that it is appropriate to use the word ‘genocide’ to describe the policy that brought about the deaths of 1.5 million Armenians in 1915. Update [27 Dec 1405]: The Knesset Education Committee decided to end its session without a vote, apparently fearful of Turkish reaction. Very unfortunate. I would rather listen to a Hamas spokesman talk about Israel than President Obama or almost any European Union leader. This is because Obama and the Europeans insist that they are concerned with Israel’s security, and then try to force Israel to adopt policies that will wreck it. They cling to the idea that Israeli withdrawals will bring about peace, contrary to historical precedent or reasonable estimates of the intentions of Israel’s enemies. They make my head hurt. The Hamasnik, on the other hand, does not pretend to care about Israel or Jews, except as targets, and honestly admits his intentions. What both the Westerner and the Hamasnik don’t realize (or just don’t care about) is that while their policies haven’t resulted — yet — in the demise of the Jewish state, they have created a long and unmitigated disaster for another group that they pretend to be concerned about, the Palestinian Arabs. The fact that the majority of the descendents of those Arabs who fled Israel in 1948 have been kept in concentration camps since then is not Israel’s fault. It is directly attributable to the inhuman plan of the Arab nations, aided and abetted by the West, who have paid for the unique institution of UNRWA, the UN agency dedicating to perpetuating the ‘refugee problem’. Since this can’t possibly help the ‘refugees’, the only reason for it is to hurt Israel. …the Palestinians are stateless because the Arabs have either stripped them of citizenship they already had, or precluded them from acquiring citizenship they desire to have. Everyone agrees that the conflict can’t be ended without solving the refugee problem. It should be obvious that an American/European style ‘two-state solution’, even if it explicitly calls for Arab ‘refugees’ to settle in the new state of ‘Palestine’ rather than Israel, cannot do so. Such a state would in effect be one big refugee camp, with several million Arabs that have no economic outlet seething in a pot next door to Israel, waiting for the opportunity to overrun it. A Gaza strip on steroids. The PLO version of the ‘two-state solution’ is even worse, since it will not take in any ‘refugees’ — they can only go to Israel in the PLO plan! I’ve called this the ‘two Arab state solution’. There is a way to solve the refugee problem, and the Isareli-Arab conflict as well. The only difficulty is that so many people are stuck on the American/European two-state non-solution, or the Arab ‘Israel gone’ solution that they won’t listen. Although this plan would provide security for Israel and a decent life for Palestinian Arabs, I expect howls of outrage from the Left and the Arab camp, since they don’t want either of the above. While the first two elements of the proposed solution are directed toward addressing the plight of the Palestinians in the Arab world, this measure is aimed at those in Israeli-administered areas. It involves allowing individual Palestinians free choice in charting their future and that of their families. These efforts should focus on two elements: (a) Generous monetary compensation to effect the relocation and rehabilitation of the Palestinian Arabs residents in territories across the 1967 Green Line, presumably mostly – but not necessarily exclusively – in the Arab/Muslim countries. Talk about howls of outrage, this will do it. I’m sure Sherman has already been greeted with accusations of racism, Hitlerism, genocidal intent, etc. Nevertheless, it seems to me the only one of the recent plans — the Obama plan, the Arab Initiative, etc. — that promises an actual solution. Sherman’s articles represent a breakthrough in the direction of reason and humanity. The chance of anyone with the power to implement them taking them seriously is small. Recently, there has been talk about Hamas joining the PLO. I know it’s a little confusing — you have the PLO, which is an umbrella organization of Palestinian Arab terrorists mostly controlled by Fatah, the organization founded by Yasser Arafat (among others). The Oslo accords recognized the PLO as the ‘sole legitimate representative of the Palestinian people’, and created the Palestinian Authority (PA), controlled by the PLO, which rules the Arabs in those territories from which Israel withdrew during the Oslo process — except for Gaza, where Hamas overthrew the PA in a murderous 2007 coup, which included shooting Fatah members in the knees and throwing them off of tall buildings. Mahmoud Abbas is the leader of Fatah and therefore PA ‘President’ except that his term ended in 2009 and new elections have not been held. Anyway the Oslo accords established a ‘chairman’, not a ‘President’, but it sounds better so that’s what they call him. He is also President of the State of Palestine since 2007, which is not a state, but is represented in the UN by the PLO. Is all that clear? Fatah is supposedly a Marxist organization, since Yasser Arafat wanted support from the Soviet Bloc while there was an Soviet Bloc. In fact it is a collection of various clan mafias. All PA officials live in huge villas, and most Palestinian Arabs that are not related to them hate them. 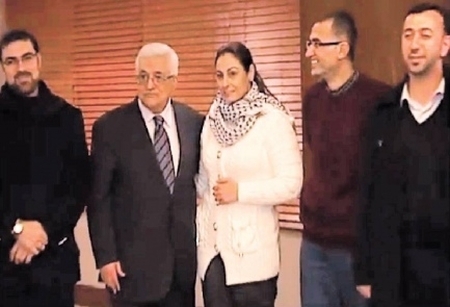 There is a Palestinian Prime Minister, Salam Fayyad, who is a Western-educated technocrat that is the only one the Western donor countries consider honest enough to deal with. He has zero power in the PA (they keep him so that they can continue to get money from the stupid Western democracies). Hamas hates him and he is always an issue when they talk about unification. The PLO has murdered more Jews than anyone since Hitler. Hamas and Hizballah envy its record. Hamas is an Islamist organization which believes in killing Jews and liberating all of ‘Palestine’ by violent jihad. Actually Fatah believes in these things too, but tries to keep public statements of its position ambiguous. Hamas is usually quite honest in stating their goals in the strongest terms. Mahmoud Abbas has said on numerous occasions that he is opposed to violence, because it ‘hurts the Palestinian Cause’, which is to eliminate the Jewish state. One of the ‘attractive’ things about Abbas is that he sees no contradiction between praising the glorious heroes and martyrs of the Palestinian Cause — that is, people who have murdered Jews en masse or in interesting ways — and claiming that he is opposed to violence. As I’ve said before, this is sort of like Kellogg claiming to be opposed to cornflakes. In this area he is even sort of a feminist, especially praising female murderers as examples for Palestinian young womanhood. So he recently had a hug for Amna Muna, in Turkey, where she was banished after being released as part of the Shalit jailbreak (oops, ‘prisoner exchange’). Muna, of course, is the so-called ‘terrorist temptress’ who led a 16-year old Israeli boy to his death. And then, of course, there is Dalal Mughrabi, leader of the terrorists who killed the greatest number of Israelis in a single incident, the 1976 ‘bus of blood’, in which 37 Israeli civilians, including 13 children, were murdered. Her birthday is a PA holiday, marked by Abbas every year. We should also not forget Ahlam Tamimi, one of the terrorists responsible for the Sbarro Pizza bombing in Jerusalem. She received 16 life sentences, but also got out in the Shalit jailbreak. She, too, is a hero of the PA, even though she committed her murders on behalf of Hamas. But what are tactical and religious differences when everyone’s working for the same ultimate goal? You really have to hand it to the PLO, the way they empower women. No back of the bus for them!